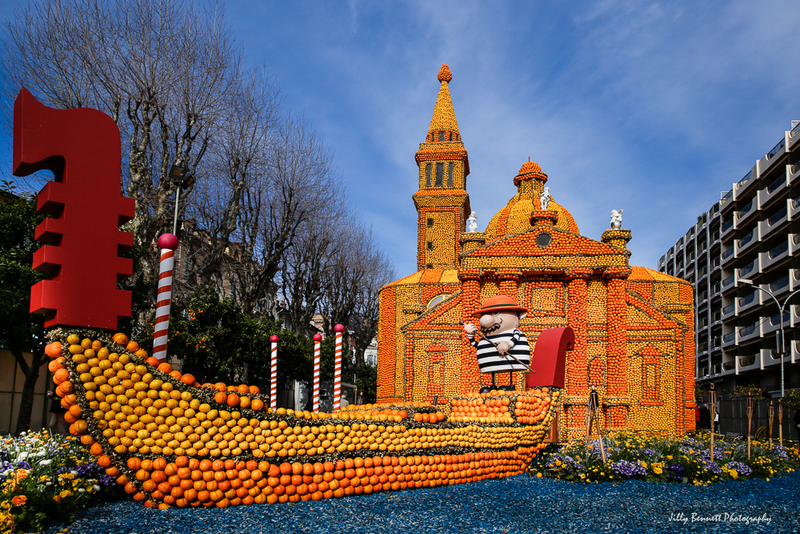 The Fête du Citron lasts for three weeks with an average of 240,000 visitors each year and up to 145 tonnes of citrus fruit used. Rien d'étonnant quand les visiteurs de la Fête du Citron de Menton se tiennent émerveillés devant les « motifs » exposés . Cette année, le thème est « Cinecittà ,le Cinéma Italien », voici la Basilique Saint-Marc et une gondole - et voila le fabuleux film de Visconti, « Mort à Venise ». La Fête du Citron dure trois semaines avec une moyenne de 240,000 visiteurs chaque année et jusqu'à 145 tonnes d'agrumes utilisées. Wow! What a pretty sight. Beautiful post, Madame Jilly! Thank you so much. Beautiful too your photo of such a work of art! Love the color yellow and love lemons too. And Visconti, what a genius. His Death in Venice, fabulous indeed! I read that when he was searching for a piece of music that would echo the events on screen, he used his favorite movement, the Adagietto (from Mahler's Symphony No.5) thus taking the liberty of turning Death in Venice's main character Gustav Von Aschenbach from being a writer to a composer. Visconti skilfully uses the Adagietto to bookend the film. It sets the melancholic mood as Aschenbach's ship steams into Venice at the opening, and returns as the composer dies in the rain. Here then, the Adagietto, on piano by a great French virtuoso.